NOTE: When planning your visit please allow an additional hour for our safety orientation procedures, in effect a 1.5 hour ride turns into a 2.5 to 3 hour experience. Tassiriki Ranch is nestled among the cane fields at South Ballina on the Far North Coast of New South Wales. Located just 75 minutes south of the Gold Coast and only a short drive from the trendy seaside towns of Byron Bay and Lennox Head, Tassiriki Ranch is perfectly located for day trips from the Gold coast and overnight and weekend getaways from Brisbane. Tassiriki Ranch is situated in the rural suburb of Empire Vale just 4 klms off the Pacific Hwy and only 15 minutes south of the busy seaside town of Ballina. If you are coming from the north and traveling south on the Pacific Hwy Motorway with the opening of the Ballina bypass access to the ranch is easiest via Wardell 16 klms south of Ballina. Traveling south along the Pacific Hwy Motorway proceed 16klms past Ballina following the signs to Grafton. Cross over the Richmond River bridge (1klm south of the Wardell turn-off) then take the first left into River Drive. Proceed 4.2 klms north along River Drive then turn right into Moylans Lane (note - the street sign "Horse & Rider Accommodation"). Tassiriki Ranch is at the end of Moylans Lane on the left. If you have chosen to exit the Motorway and drive through Ballina the northern access is via the Burns Point Ferry on the southern outskirts of Ballina township. Proceed south along the Old Pacific Hwy through Ballina following the signs to Grafton. At 100m south of the Big Prawn turn left off the Old Pacific Hwy into Burns Point Ferry Rd, cross over the Richmond river by ferry then head south along River Drive for 7klms, turn left into Moylans Lane (note - the street sign "Horse & Rider Accommodation"). Tassiriki Ranch is at the end of Moylans Lane on the left. PLEASE NOTE: A $4.40 fee applies to all cars using the ferry. The ferry operates from 5:30am to 12:30am 7 days a week. The ferry closes for maintenance from 9:00am to midday on the second Tuesday of every month. When towing a horse-float the access to Tassiriki Ranch via Burns Point Ferry can be difficult at low tide, a safer option is to come via the southern most access at East Wardell. 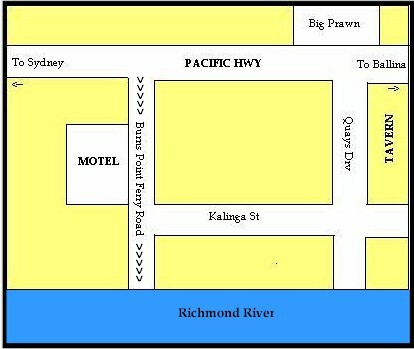 If you are come from the south traveling northward along the Pacific Hwy you will pass through Woodburn then Broadwater (the Sugar Mill passes on your left), then just before the Richmond River bridge (big metal span opening bridge appears ahead) you turn right into River Drive (note - the street sign "Horse & Rider Accommodation"). Travel 4.2klms along River Rd then turn right in to Moylans Lane (note - the street sign "Horse & Rider Accommodation"). Tassiriki Ranch is on the left at the eastern end of Moylans Lane.